White Deer Run at Blue Mountain recently agreed to adopt a two-and-a-half mile section of the Schuyl kill River Trail for a three-year period. The adopted stretch is located on the Bartram Section of the trail beginning at the Kernsville Dam Trailhead in Hamburg.White Deer Run at Blue Mountain is a residential treatment program for adults who are struggling with addiction. Program Director Leslie Eckert, who is also a Schuylkill River Trail Ambassador, worked with our Trail Volunteer Coordinator Katie Flahive on the adopt-a-trail agreement. Under that agreement, White Deer Run staff and clients will conduct trail cleanups and pruning twice a year to help maintain that section of trail. The group has already participated in their first cleanup. “It was a positive experience for our clients and it gave them a sense of accomplishment,” said Eckert. 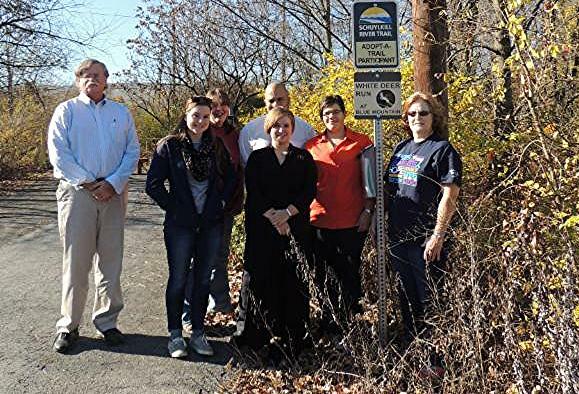 The Adopt-a-Trail program was introduced by the Schuylkill River Heritage Area in 2010 to help maintain the Berks and Schuylkill County sections of Schuylkill River Trail, which are managed by the Heritage Area. Since limited funds are available, the Heritage Area relies on volunteers to groom the trail and trailheads along the 30 miles of trail located in those counties. Learn more about our volunteer trail programs. Photo (l to r): Heritage Area Trail Projects Manager Robert Folwell and Trail Sustainability Coordinator Katie Flahive stand with White Deer Run Clinical Technician Stacey Green, Clinical Supervisor Charles Dixon, Administrative Asst. Brianna Marquez, Facility Svcs Coordinator Janelle Kupetz and Program Director Leslie Eckert.